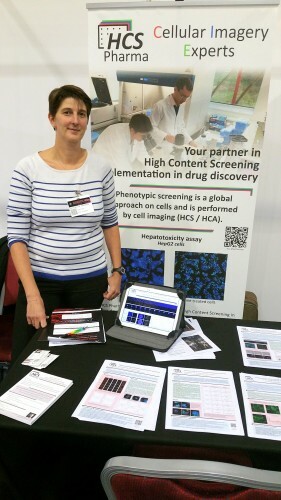 We were present in the innovation zone of Drug Discovery 2015 congress last week in Telford. We had the opportunity to present our work with two posters. The first one was about the development of a neuroprotection assay as a Parkinson’s desease model in 2D culture. First results on 3D culture, where we can see the neurites connecting different spheroids, were also presented. The second poster showed the validation results of steatosis & phospholipidosis assay on HepG2 cells. During this meeting, we had the opportunity to discuss with a lot of people around these posters and at our booth. It was also a pleasure to learn that Celenys, our partner for 3D culture, won the award of innovative technology for their biomimesys technology. Felicitation to the Celenys team!